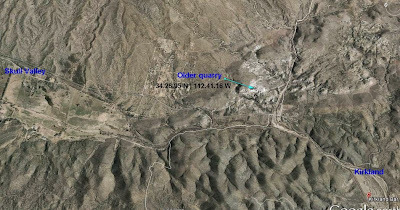 For further information the concerned citizens of Skull Valley and those surrounding the area of the mine created a website: kirklandmineforum.org please check this site continually for updates on meetings and information as it is being gathered. We strive to maintain accuracy, so if you find something in error, please contact the webmaster. This is exciting and great news! If you've taken Dr. Burt's Ore Deposits class at ASU you stopped here on the way to Bagdad! Spread the word and let your opinion be known by local political representatives, the BLM, and the media. They intend to remove an existing stockpile denise, I didn't read anything about mining continuing. Actually, per the Yavapai County Board of Directors meeting yesterday (6/1) their intent is to open pit mine numerous parcels they have the mineral rights to, over a total of 320 acres of pristine land. Google erionite, a byproduct of mining this mineral. As a particulate in the air, it has the same properties as asbestos. Article on the YC board meeting re Kirkland Mine proposal.